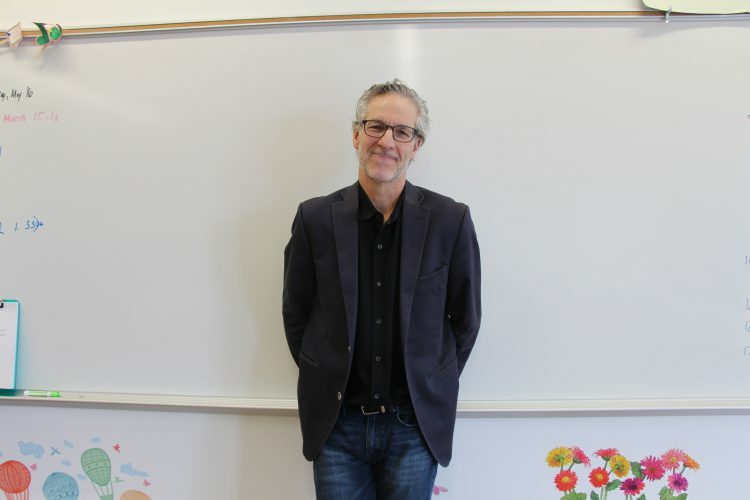 On February 26th, Bob Tedeschi, a seasoned journalist, came to The Morgan School to speak to a room of students about his experience in his field. English teacher Leslie Chausse’s journalism class and technology teacher Jess Mularski’s broadcast class came together to ask Tedeschi some questions about his profession. Bob Tedeschi graduated from Columbia Journalism School and has worked for establishments such as The New York Times, The Connecticut Post, NPR, and is currently writing for STAT.com. He has accomplished a lot in his career, including two feature writing awards from the Connecticut Society of Professional Journalists. His list of credentials is quite lengthy, so the students were eager to get advice from a reputable source. Tedeschi took questions from the students and spoke about his personal experiences in the field. He spoke highly of the importance of journalism. He feels that most journalists, himself included, work with integrity and simply want to give the public the best story possible without twisting anyone’s words. He also spoke candidly about how journalists work their way up the ladder to success. Tedeschi told the class that most journalists start at a very low-level writing in order to collect “clips” to build up a portfolio. Only after they do that can they move up in the world of journalism. Mr. Tedeschi also spoke about the differences between journalism at the beginning of his career and today’s journalism. He told the class that up and coming journalists have an advantage when it comes to technology. Tedeschi explained that he had to learn how to use technology as it developed and changed, but the younger generation naturally has a knack for technology because they grew up with it. Social media also plays a huge role in helping journalists report on modern day issues. He spoke especially highly of Twitter, saying that he often uses it to gather information for an article. Although social media puts young journalists at an advantage, Tedeschi also touched on the issues that the aspiring reporters may face. It’s obvious that the media is beginning to dominate other news sources such as newspapers or magazines. While this makes information more accessible, Tedeschi admits that it makes online journalism even more competitive. Up and coming journalists from all over the world will be competing with one another for jobs at popular news outlets such as Buzzfeed, Vice, etc.. The students were extremely appreciative of Bob Tedeschi taking the time out of his day to lend them some useful tips and tricks that they can use in the future. Tedeschi left the class with a better understanding of the industry that they are striving to work in.